Once search console verifies your website you will be able to see in the list of websites or if you have submitted the first time you will see only your website, click on your website link. Then you will get the following screen. In the left side you will see four expandable menus which are, Search Appearance, Search Traffic, Google Index and Crawl and I will explain all abut them. But first I will start from Search Traffic menu. Search Appearance-> Structured Data- To understand this you have to understand this question. A forum www.schema.org founded by, Google, Microsoft, Yandex and Yahoo , standardises data format to make search engines understand easily is called structured data, and websites use in several ways, for example, recipes images and many more, if you want understand more about structured data see the structured data testing tool and do some experiment. Search Appearance->Rich Cards- How structured data can be used to produce rich results these types of features called rich cards to understand better see the link rich cards. Search Appearance->Data Highlighter- Showing ratings in search results or event listings features can be added. Search Appearance-> HTML Improvements- This section address issues related to meta description, title tag and non-indexable issues. Search Appearance-> AMP- This section finds out your website appearance issues related to mobile devices. Search Traffic->Search Analytics- In search traffic menu the first option is Search Analytics and the option shows that how your website appears in Google search and gathers statistics, such as, average number of clicks when your website appeared in Google search. Furthermore, there are four check boxes. Clicks->How many times users clicked when your website appeared in Google search. Impressions-> How many times users clicked on your websites link. Average Search Position- If your website appeared 3 times and position of the website was 4, 5 and 6 then average position will be 5. After selecting four options, you can check them against Queries, Pages, Countries, Devices, Search Types and Dates. Search Traffic-> Links to Your Site- This option shows your website's back links, as well as, how your website internally linked. Search Traffic-> Internal Links- This will also show that how links are internally connected including labels. Search Traffic->Manual Actions- Your website is not compatible with Webmaster reported by a human being. Search Traffic->Mobile Usability- Mobile usability error reports. 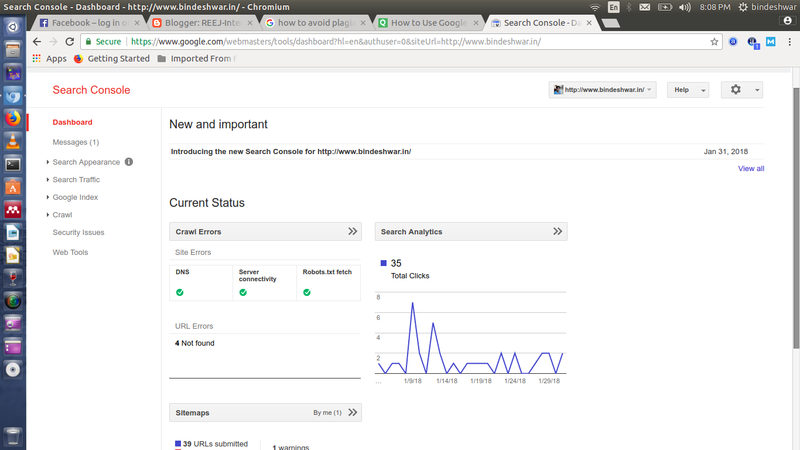 Google Index-> Index Status- It shows how many URLs are added in Google's index database. Google Index->Blocked Resources- Shows the that Googlebot can not access, due some internal configuration or may be blocked by Robot.txt file. Google Index->Remove URLs- It shows the URLs permanently removed from Googles index database. Crawl->Crawl Errors- Number of 404 status found by Crawler. Crawl->Crawl Stats- Shows Googlebot activity, for instance, how many average pages crawled by bot, average downloaded pages size and average spending time. 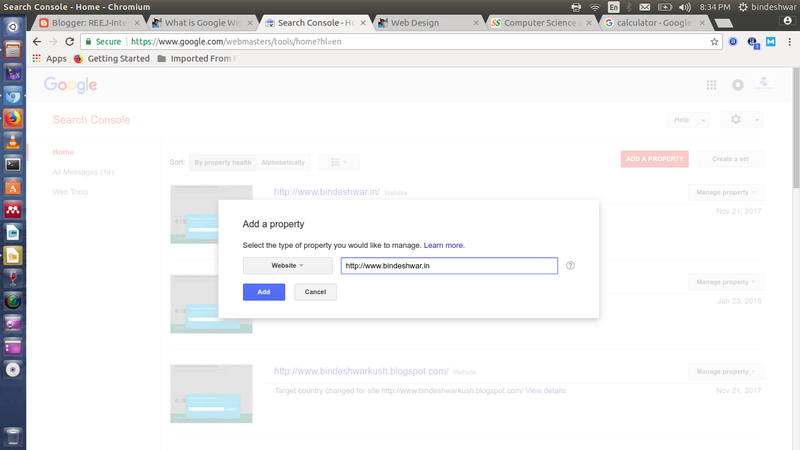 Crawl-> Fetch as Google- This is very important section, here you can submit URLs that will be assigned to index. Crawl->robots.txt Tester- Here you can edit your robots.txt file and check the errors. Crawl->Sitemaps-Here, you can submit sitemaps of your website and you can also see how many URLs have got indexed. Crawl->URLs Parameters- Do not touch these parameters and let bot decide the values. Conclusion- In this tutorial, I have given some basics explains that can help you to get basic understandings of a webmaster's tasks. Furthermore, on the time of writing this article the Beta version of new search console was launched but was still under migration process from the old to the new one.